The Group’s capital adequacy is managed on the Bank level. It is aimed to ensure that the Bank's equity level is not lower than the one required by internal and external regulations. The regulations link the required capital level with the scale of operations and risks assumed by the Bank. Integrates the capital adequacy assessment with development of the Bank’s Strategy, financial and sales plans. For the purpose of equity calculation, the Bank applies methods arising from Regulation of the European Parliament and of the Council (EU) no. 575/2013 of 26 June 2013 on prudential requirements for credit institutions and investment firms and amending the Regulation (EU) no. 648/2012. The equity of the Bank consists of Tier 1 (CET1) and Tier 2 funds. Carrying amount of intangible assets. In 2014, Tier 2 funds in the Bank included cash obtained from a subordinate loan received in 2014 from Poczta Polska and two issues of subordinate bonds (carried out in 2011 and 2012, respectively). The method of calculating the capital requirement due to large exposures. Since the trading scale was immaterial and the level of currency transactions performed was low, the capital requirement regarding market risks and currency risk for the Bank was PLN 0.00. This meant that at the end of 2014 the Bank’s capital requirement was limited to credit risk, operational risk and risk of credit valuation adjustment. In 2014 the supervisory solvency ratio was above the required regulatory minimum. When identifying key risks that occur in the Bank’s operations, having included the scale and complexity of a given operation, additional risks are considered which, according to the management, are not fully covered by Pillar 1 risks. The identification is to optimally adjust the structure of internal capital to the actual capital needs that reflect the true risk exposure level. For the additional risk purpose, the internal capital is calculated based on internal methods accepted by the Management Board, which include the scale and specifics of the Bank’s operations in a given risk context. Additionally, when determining the internal capital, the Bank applies a conservative approach with regard to risk diversification among each risk type. Please note that due to the specifics of liquidity risk and in light of market standards and practices, the Bank does not determine an additional internal capital for this risk type. For this reason, special focus is placed on the process evaluation and management. In 2014 the internal solvency ratio was above the required regulatory minimum. the date of approving the annual financial statements by its General Shareholders' Meeting. 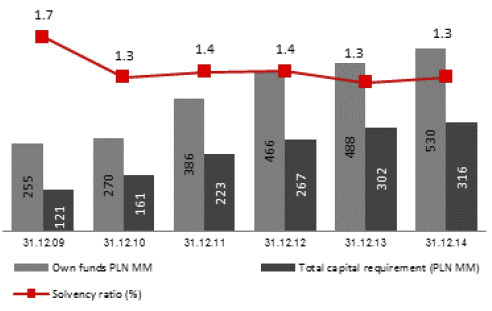 The following tables present detailed calculation of base figures regarding regulatory capital and the solvency ratio as at 31 December 2014 and 31 December 2013. In 2014 the Bank’s activities ensured the maintaining of capital ratios on a save level, above the regulatory minimum.